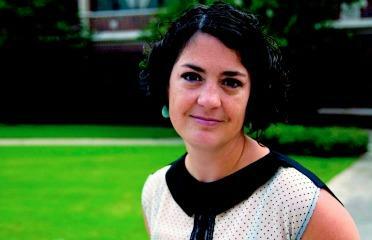 Laura Murphy, Ph.D., is a tireless advocate for survivors of human trafficking. View the complete issue of fall 2013 LOYNO Magazine. There are 27 million people enslaved globally, and New Orleans is no exception when it comes to cases of modern slavery. That’s according to Loyola University New Orleans assistant professor of English Laura Murphy, Ph.D. In order to eliminate human trafficking in the Crescent City, Murphy created the Loyola University Modern Slavery Research Project. “How can I possibly live in this world where there is slavery happening now and not address it, pretending it’s a thing of the past?” Murphy says. Murphy is joined by several Loyola faculty who are pursuing projects related to trafficking, including Loyola assistant professors of criminal justice Christian Bolden, Ph.D.; Brenda Vollman, Ph.D.; and Rae Taylor, Ph.D., as well as migrant specialist and fellow Sue Weishar, Ph.D., from Loyola’s Jesuit Social Research Institute. They work together to apply for funding and launch local campaigns as well as nationwide research studies on domestic slavery. Currently, they are waiting to see if the team will receive a $500,000 grant from the United States Department of Justice. Murphy says the grant will fund a three-year research study that includes federal prison visits to talk directly to traffickers, interviews with survivors of domestic slavery, and a study done in New Orleans during the third year to test an antihuman- trafficking plan that will be implemented in cities all over the country. Bolden has already received a $10,000 FBI fellowship that includes investigating human trafficking, and thanks to a generous corporate gift to the Office of Service Learning, Murphy has received a $3,000 community-engaged research fellowship to help gather evidence for her white paper, the “New Orleans Human Trafficking Report.” The goal of the report is to inform the public and stakeholders about the critical issues surrounding human trafficking. With the secret nature of modern slavery, however, retrieving evidence is difficult, to say the least. “It’s really hard to find good statistics, so we’re trying to find out who knows what and who can get more data to be collected so we can at least paint an anecdotal picture of the situation,” Murphy explains. Fortunately, Murphy also has the help of three avid student research assistants, junior Saramaile Tate, senior Lauren Cutuli, and alumnus Brian Ea ’12 (English). One of Tate’s responsibilities is to maintain the website SurvivorsOfSlavery.org, an outreach project that aims to promote the speaking careers of survivors. In addition, Murphy is publishing a book with Columbia University Press due out in March 2014 titled Survivors of Slavery: Modern Slave Narratives. The book includes more than 40 first-person narratives, which Murphy has been collecting since 2009. Loyola’s campus also provides a meeting place for the New Orleans Human Trafficking Working Group, which initiates discussion and gives feedback on the issues surrounding human trafficking, including legislation; awareness; and resources for police, health professionals, and others who come in direct contact with victims and traffickers. The Modern Slavery Research Project gave a presentation to 20 city officials and leaders at a breakfast meeting on Sept. 11 at Loyola to launch the Make Escape Possible campaign. The campaign’s goal is to inform victims of their rights and the social services available to them if they choose to escape. “Every single person I know who is a survivor of trafficking, when they describe leaving their jobs, they don’t describe it as ‘quitting’; they describe it as ‘escaping,’” Murphy says. Students on campus are getting involved, too. The Free the Slaves chapter at Loyola turns out crowds in the hundreds for keynote events. “Free the Slaves is working to educate as many people as they can on the subject of modern-day slavery,” says sophomore Charlotte Lapp, co-president of Loyola’s Free the Slaves chapter. Murphy admits research on modern slavery can be frustrating and difficult at times but believes the issue is far too important to ignore. Kate Trotter ’14 (marketing) works as the publications and marketing assistant for the Office of Marketing and Communications.